One of the Leeds City Hall lions, by Keyworth Jr.
William Day Keyworth the Elder was the son of a marble mason from the town of Hull, who when Keyworth was a child, moved to London and worked for Chantrey. Keyworth studied under Henry Weekes (himself a pupil of Chantrey) in London, and then went back to his home town in 1834 to set up as a sculptor in his own right. By 1892 he is listed in a Hull gazetteer as at 54 Savile Street and 244 Spring Bank, as ‘William Day Keyworth and Son, monumental masons and sculptors’. as he had a sculptor son (b. 1843); Keyworth the Elder was himself the son of a marble mason from the town of Hull. He produced several works which remained in Hull, including church monuments and busts (after his death some of his unsold works were left to that city, unfortunately being destroyed when Hull Central Museum was bombed in World War II). He exhibited at the Royal Academy in the late 1830s and early 1840s, and later worked as an architect, and made casts of medieval architecture for the 1851 Exhibition. Keyworth Sr’s remaining works are not particularly prolific, and I have not seen what survives by him in Hull. What does survive consists mainly of busts and slighter church monuments in Yorkshire and Lancashire. William Day Keyworth junior (1843-1902) studied sculpture in London, and was responsible for a variety of works in Hull, including statues of Michael de la Pole (Hull’s first mayor), Wilberforce for Wilberforce House, and Andrew Marvell. 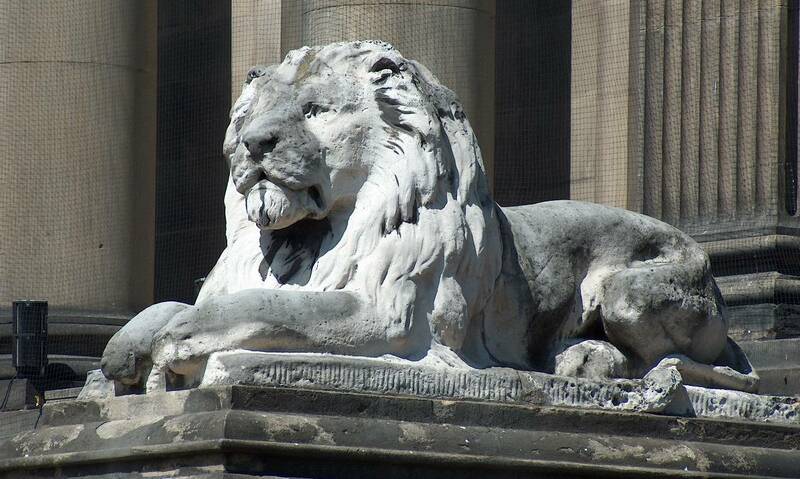 In Leeds may be found his stone lions in front of Leeds Town Hall (picture above), and a reclining effigy of Dr Hook is in the Leeds Parish Church. He has a good seated figure of William Gray in Hartlepool. In London he sculpted the memorial bust to Rowland Hill, in Westminster Abbey. He suffered financial problems in later life, and committed suicide in 1902.